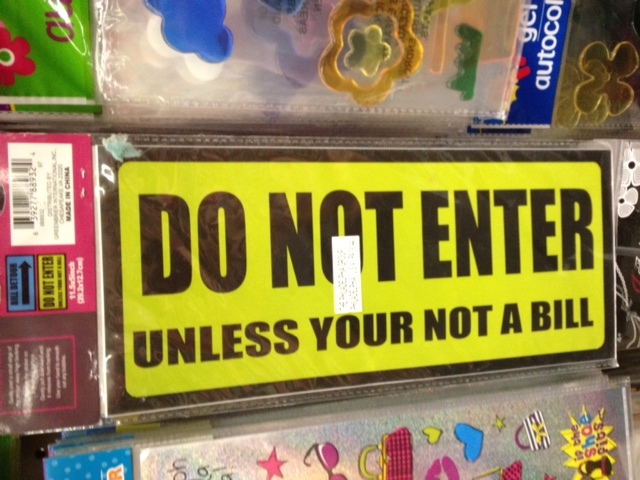 Colleen found this at the Dollar Tree, and admits she shouldn’t really be surprised. Okay, I’m confused. What the? Yeah, yeah, I see the typo, but what is this? Is it a sign sold to children with siblings named Bill? Does it go on your mailbox and address anthropomorphized letters? What will this artifact tell future civilizations about us when they dig it up completely intact from the landfill? Thanks for a fun week, Colleen!